I don't think it's appropriate to try and unlock the secret of Kinder, or the overwhelming effect of his work on me. But without a conscious glimpse, you might be tempted to label anything and everything I say as mindless gushing. Well, I've got a mind all right. And you have to see this. It's the pure and natural uber-coolness of his collections that never ceases to amaze me. There is exuberance without over-complication, genius without forced cleverness, boldness and optimism without any sort of vulgarity, cuteness without a saccharine aftertaste, art instead of snobbishness, and desirable, wearable clothes around a concept that is not forced on you. Plus that je ne sais quoi, a sense of style expressed in a way that hits close to home. When what you see on the catwalk seems to describe a certain part of you to astonishing detail, falling for it is as easy as breathing. Now, that's what it's like for me. For Kinder, inspiration came via Hemingway's Old Man and The Sea, conversations, man to sea, woman to woman, and the strength of womankind. And while these did translate into sky and sea, antique maps and sailor-tattoo prints, double breasted blazers, fishermen's caps and rain macs, it also comes across that the novel sparked a deeper creative process of poking around life and getting a feel for the different roles people play, and the tools they have, to fight the elements and fulfill their destinies. An imprint left by last season's cowboys lingers in the western shirts and in the large diagonal gingham print. But as one collection morphs into the other, so do the prints within this one - they are combined, layered or standing alone, like characters, qualities or locations in a story. 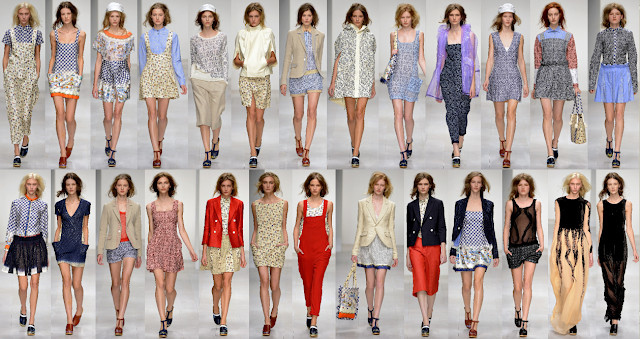 The more feminine, baroque tapestry style sailor print, either alone or layered with youthful gingham, is like a home or a family, a natural backdrop to all the seaworthy action as it reaches its climax in the swirling surreal softness of the octopus gowns, of meeting your destiny... a final step that very nearly takes Kinder from Hemingway through García Márquez and into the realm of realismo mágico. A sequel to this mood piece, apparently part of The Story of My Immortal.